Celebrity tattoos Former "90210" star Tori Spelling was recently spotted with a new tattoo that honors her husband's wedding vows with seven poetic lines. 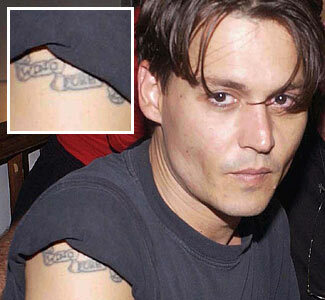 What are other celebrities thinking when they ink themselves? This inked-up actress is known for her many tattoos . The most noticeable one, on her left shoulder blade , is of a Buddhist saying written in Khmer script . A seventh line in the tattoo on her left arm recently sparked rumors that the Jolie-Pitt clan may soon expand. This actress has a Shakespeare line tattooed on her back. This actor inked a former girlfriend's name on his arm during a whirlwind romance.But after the split he had it changed to mean he's a fan of this drink. 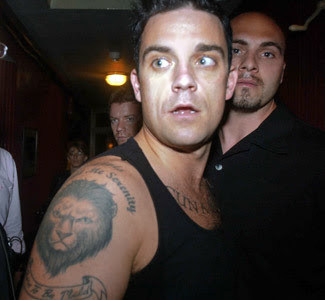 This Brit-pop star and former boy band member sports a lion's head on his right shoulder under an homage to this legendary singer. Though Rihanna has many tattoos, this is one of the most recognized. A famous face tattoo: Once celebrity famous got a tribal face tattoo. Whose tattoo is this? Milano's tattoo represents her upbringing, practicing this religion. A famous neck tattoo: This young star, who got her start on an MTV reality show, has a tattoo on her neck/upper back that hints at something sweet and dangerous. Whose tattoo is this? 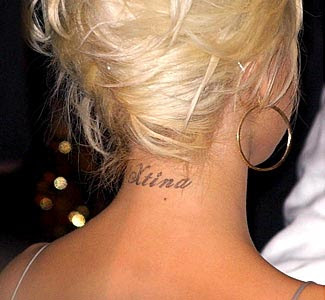 After creating this sultry alter ego in 2002, pop diva Christina Aguilera tattooed the name on the back of her neck. A famous arm tattoo: A member of a legendary band, this rocker is part Native American and has a picture of this legendary chief on his left arm. Whose tattoo is this? 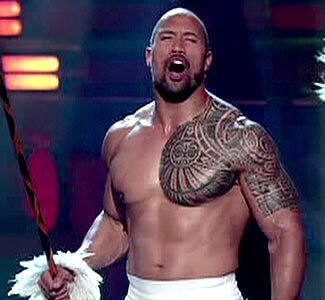 Known as "The Rock," he traveled to a warm-weather state to have his family history tattooed on his left shoulder in this type of cultural art. A famous back tattoo: This footballer has several tattoos but one that stands out is the angel on his back, with three names in it. Whose tattoo is this? 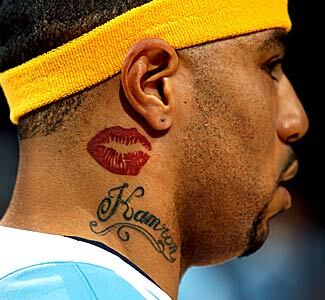 NBAer Kenyon Martin has said he got this tattoo for this former girlfriend, who also is a hip-hop artist. Who is she? Famous tattoos underneath arms: Martin's Denver Nuggets teammate has notable tattoos under both arms that represent his nickname. Whose tattoo is this? 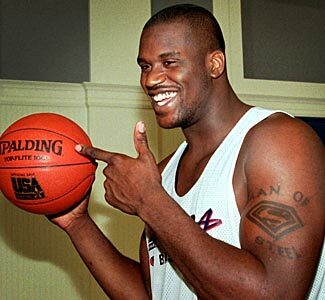 Shaq tattooed this super hero's emblem on his arm. A famous flag tattoo: In 2006, this actress traveled to her father's home country and got a double-headed eagle tattoo on her back with the symbol of the country's flag. Whose tattoo is this? 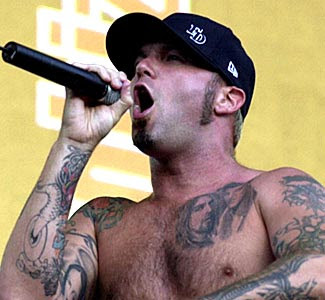 Rocker Fred Durst put rap-metal genre on the map in the late '90s. He famously has a tattoo of two other legendary rockers on his chest. A famous family tattoo: This A-list actor has played some obscure characters, but the tattoo of his children and long-time girlfriend is more sentimental than obscure. Whose tattoo is this? 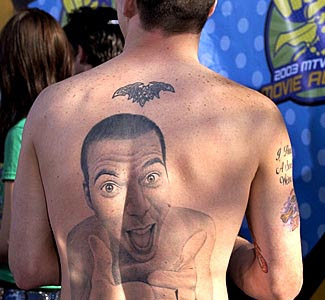 "Steve-O" is best known for his outrageous stunts, as well as his well-tatted body, but one tattoo stands out from the rest. Another famous portrait tattoo: This legendary actor is usually on the silver screen shooting bad guys down but this well-drawn portrait of his wife shows his softer side. Whose tattoo is this? Penélope Cruz's silence about the meaning of the numbers on her ankle tattoo continues to baffle. Speculation ranges from a theory involving numerology, to this religion. An NBAer's many, many tattoos This former NBA "Bad Boy" was mostly known for his audacious style .He has the mascot of a former team tattooed on his chest. Whose tattoo is this? 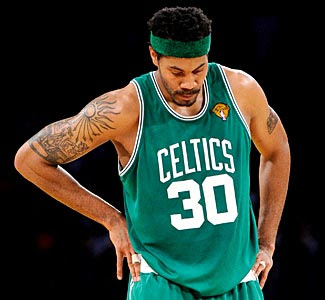 Though Rasheed Wallace never played for this sunny NBA franchise, the tattoo on his right arm depicts this sun god from an ancient Mediterranean empire. Another NBAer's plentiful tats. This former NBA MVP seemingly made a fashion statement with just about everything he wore, including his tattoos. He has his college's mascot, the Georgetown Hoyas. Whose tattoo is this?